Jennifer Aniston gets help down the stairs of The Ritz Hotel from her boyfriend Justin Theroux as they head out to dinner at Le Jules Verne Restaurant in the Eiffel Tower on June 13, 2012. David Beckham and Victoria Beckham attend the 2012 Vanity Fair Oscar Party at Sunset Tower on February 26, 2012. Jay-Z and Beyonce attend the 2012 Sports Illustrated Sportsman of the Year award presentation at Espace on December 5, 2012. Tom Brady and Gisele Bundchen attend the "Schiaparelli And Prada: Impossible Conversations" Costume Institute Gala at the Metropolitan Museum of Art on May 7, 2012..
Actor George Clooney and Stacy Keibler arrive at the 26th Anniversary Carousel Of Hope Ball at The Beverly Hilton Hotel on October 20, 2012. British actor Daniel Craig and his wife Rachel Weisz attend "The Girl With The Dragon Tattoo" premiere at Callao cinema on January 4, 2012. Actors Liam Hemsworth and Miley Cyrus arrive at the 8th Annual Australians In Film Breakthrough Awards at InterContinental Hotel on June 27, 2012. Actors Andrew Garfield and Emma Stone speak at Nickelodeon's 25th Annual Kids' Choice Awards held at Galen Center on March 31, 2012. Actors Eva Mendes and Ryan Gosling attend "The Place Beyond The Pines" premiere during the 2012 Toronto International Film Festival at Princess of Wales Theatre on September 7, 2012. Catherine and Prince William arrive at Queenstown for the community cultural visit on day 2 during the Diamond Jubilee tour on September 12, 2012 in Singapore. Producer Swizz Beatz and Singer Alicia Keys arrive at the 2012 Billboard Music Awards held at the MGM Grand Garden Arena on May 20, 2012. Actress Emily Blunt and husband actor John Krasinski attend the "Looper" opening night gala premiere during the 2012 Toronto International Film Festival on September 6, 2012. Jury Member Diane Kruger and actor Joshua Jackson attend the 'Killing Them Softly' Premiere during 65th Annual Cannes Film Festival at Palais des Festivals on May 22, 2012. Angelina Jolie and Brad Pitt attends the 23rd Annual Producers Guild Awards at The Beverly Hilton hotel on January 21, 2012. Gwen Stefani and Gavin Rossdale arrive at the Heart Foundation Gala - Arrivals at the Hollywood Palladium on May 10, 2012. Jessica Biel and Justin Timberlake attend the "Schiaparelli And Prada: Impossible Conversations" Costume Institute Gala at the Metropolitan Museum of Art on May 7, 2012. Kayne West and Kim Kardashian attend the Angel Ball 2012 hosted by Gabrielle's Angel Foundation at Cipriani Wall Street on October 22, 2012. Everyone loves a cute celebrity couple! What makes these celebrity love-birds even better is the passion for fashion. From the beautiful Beyonce and Jay-Z to Kourtney Kardashian and Scott Disick, we can always count on these celebs to give us memorable couple fashion. We've seen some pretty stylish couples walk down the red carpet this year and can't wait to see what they have in store for 2013. 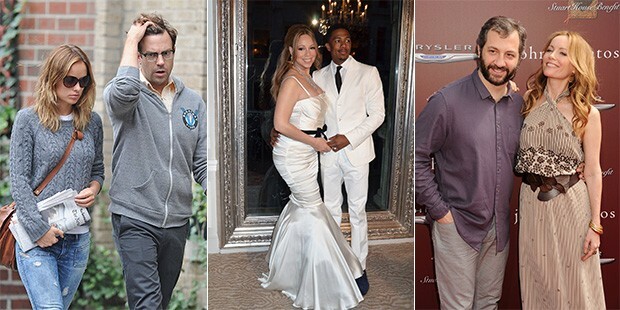 Check out the best dressed celebrity couples in the slideshow above!